Two teenage boys in eastern China killed themselves on May 2 for “failing to complete homework assignments,” according to state-run media. They were due back at school that day, following the three-day Labor Day holiday. Both incidents took place in Nanjing, the capital of Jiangsu Province. A 13 year-old boy from Lishui County got up at 4 a.m. Thursday to finish homework, but hanged himself on the staircase shortly after. 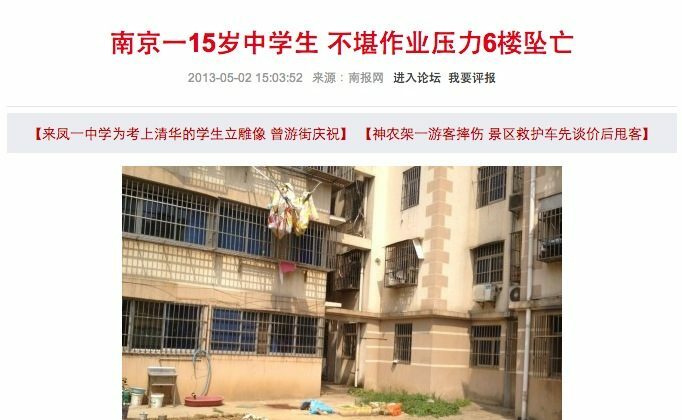 Then at around 11 a.m., a 15-year-old student from Najiang Middle School jumped from the sixth floor of the building where his family lives. He was the only boy in the family. The younger teen left a note for his parents, saying he loved and felt sorry for them, and hoped they would take lilies to his grave, the state mouthpiece People’s Daily reported. The boys were both preparing to graduate to the next level of schooling, suggesting they were under a lot of pressure to make the grade. Many other Internet users commented on the matter, pointing to the competitive education system as the cause of the problem, with its emphasis on exams. A November 2012 report by Caixin reported results from a survey of nearly 3,000 students, showing that 71.5 percent of children needed over two hours to finish each assignment, 76.3 percent spent time studying on weekends, and 27.2 percent slept for less than 8 hours per night. Speaking with China Daily, deputy director Xiong Bingqi at Beijing’s 21st Century Education Research Institute noted the difficulties faced by young Chinese at school.